What is central chest pain? 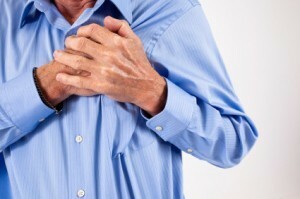 Central chest pain refers to acute pain that occurs in the middle of the chest region. Most people would frightfully associate a sudden occurrence of pain in the central chest region as something to do with the heart. They may be right in some cases. However, most causes of pain in the central chest region have nothing to do with the heart. These other causes may or may not indicate a benign condition. As a rule of thumb, one should immediately consult a doctor if the pain in the central chest region is also accompanied by dizziness, difficulty in breathing, fainting, pain radiating down the arms (especially the left arm) and excessive sweating. When these symptoms occur together, an emergency medical evaluation of the cause is warranted. Central chest pain may be accompanied by a subset of the above mentioned symptoms. The specific constellation of symptoms help in diagnosing the cause of the chest pain in specific individuals. What are the causes of central chest pain? Central chest pain could occur due to a variety of causes that may or may not be benign in nature. Some of the most common causes are described below. The chest wall is composed of bones (e.g., sternum, ribs, clavicles), muscles (e.g., intercostal muscles), cartilages (e.g., costal cartilages) and joints. A problem with any of these structures could lead to pain in the central region of the chest. Strained chest wall muscles are one of the most common causes of central chest pain. This muscular strain is mostly a result of strenuous physical activities. Pain in the region of the breastbone (sternum) could result from a variety of causes such as fractures, abnormal growths and inflammation. Costochondritis refers to inflammation of the costal cartilages and joints. Painful swelling of breasts (mastitis) caused by infections or breast feeding can cause chest pain in women. When the cause of central chest pain is localized to the chest wall, the constellation of symptoms usually include chest pain upon breathing (especially inspiration) or moving, pain upon coughing, local swelling and tender skin over the painful region. Central chest pain most often elicits fears of cardiovascular defects, especially heart attacks. Pain in myocardial infarction (heart attack) is usually associated with breathlessness, profuse sweating, nausea, dizziness, and a sharp pain that radiates down the left arm. Due to its serious nature, heart attack needs to be ruled out as the main cause of central chest pain. This is especially the case with patients in high-risk category like those suffering from angina pectoris. These patients anxiously clutch their chest and need emergency medical care. Central chest pain due to angina pectoris occurs when the blood supply to the heart muscles becomes restricted. Both myocardial infarction and angina pectoris cause pain that are similar in nature: dull and heavy pain that spreads to the adjoining arms, jaw, neck and back. Unlike the pain in myocardial infarction, however, the pain in angina pectoris is triggered by physical activities and mental stress but gets better after resting for a short duration. Other cardiovascular causes that result in central chest pain include pericarditis, diseases of the heart valves and the major blood vessel, aorta. Pericarditis refers to inflammation of the pericardium that covers the heart. Pain due to pericarditis can either be dull or sharp in nature. This pain also increases while lying down. Lungs and the airways constitute another major organ system that lies within the chest wall. Central chest pain could also mean a defect in the lungs and the associated airways. Inflammation of the trachea is the most common respiratory cause of central chest pain. This condition, also known as tracheitis, is associated with symptoms such as dry cough, abnormal breathing sounds, sore throat, hoarseness of voice and in some cases, fever. Infectious conditions of the lungs such as pneumonia and pleurisy also cause central chest pain. Pleurisy refers to inflammation of the pleura that covers the lungs. Pulmonary embolism is another lung condition that is associated with sudden central chest pain in addition to other symptoms such as acute shortness of breath, bloody cough, wheezing, paleness of skin and dizziness. Central chest pain due to gastrointestinal causes are also common occurrences. Gastroesophageal reflux disease (GERD) is the most common reason for central chest pain associated with inflammation of the esophagus. In GERD, the acid from the stomach flows back into the esophagus and damages its lining. 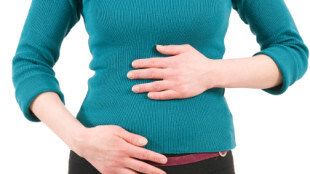 The associated painful feeling is often referred to as “heartburn”. In addition to GERD, esophageal ulcers and esophageal rupture also cause acute central chest pain. Stomach problems cause chest pain as well. Examples include peptic ulcer and stomach cancers. In addition to the esophageal and stomach disorders, diseases afflicting the gall bladder and pancreas are also responsible for cases of chest pain. Examples include acute cholecystitis, pancreatitis and pancreatic cancer. People suffering from anxiety and panic attacks also frequently report chest heaviness and pain. Heart palpitations, breathlessness, sweating and dizziness also accompany these panic attacks. Reactivation of chicken pox virus, years after an individual first contracted the disease, causes shingles. Among other symptoms that pertain to the skin, shingles also causes chest pain. What is the treatment for central chest pain? The treatment of central chest pain depends on the specific cause of the condition. As described above, central chest pain could be caused by a variety of factors which may or may not be benign. Due to the possible involvement of critical organ systems, it is advisable to seek prompt medical attention when a sudden pain in the chest occurs.